Delicious, delicate and sweet. Popular among all ages. 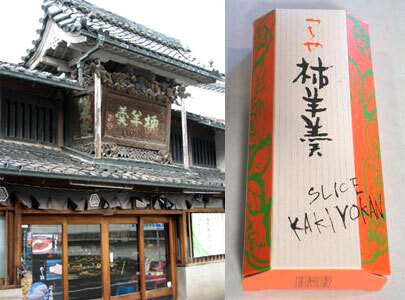 Kakiyokan has been produced by the Tsuchiya family business in Gifu Prefecture for more than 250 years. 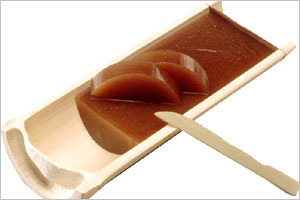 Single block of yokan, in a natural bamboo container and beautifully wrapped. Will keep for about 30 days - as this is a perishable item, it is shipped by Express Mail. 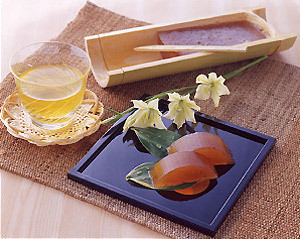 Ingredients: Sugar, bean paste, persimmon puree, agar. 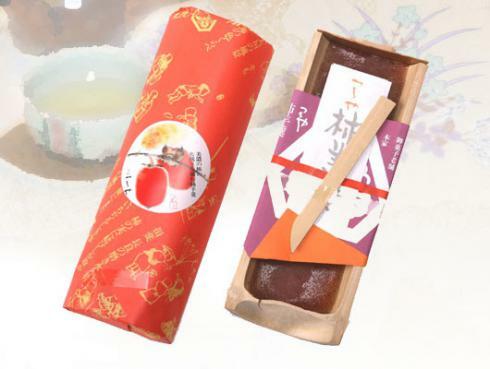 Yokan is a thick jellied sweet made of azuki bean paste, kanten (agar agar) and sugar, and it has been one of the most popular sweets in Japan since the Edo period. 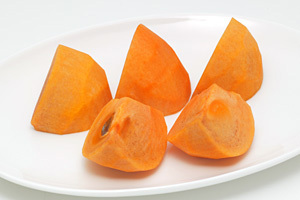 Flavored with kaki persimmon, kakiyokan has been produced by the Tsuchiya family business in Gifu Prefecture for more than 250 years. Packed in a delightful bamboo container, with a wooden slicer for serving and eating, and beautifully wrapped. Will keep for about 30 days - as this is a perishable item, it is shipped by Express Mail.